As technological innovations rapidly spread throughout society it is also changing how Americans live and work. That includes the police work done each day by the men and women of Minnesota law enforcement. Training is key to ensuring police are at their best, but it is also out of reach to many smaller communities where training budgets are slim to none existent. Departments must also update their skills as new training mandates are approved by the Minnesota Post Officer Standards and Training (POST) Board. For the past several years, the Minnesota Chiefs of Police Foundation (MCPF) has worked to advance public safety across the state by offering scholarships so local police agencies and their officers can access the latest training. Earlier this year, MCPF was able to support four local agencies and their personnel. 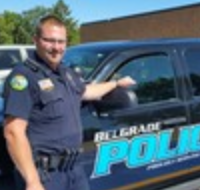 The Belgrade police department was one of the recipients. "The scholarship assisted my department with valuable training and saved the department from paying for it, so those funds could be used toward another officer to go to training," says chief Casey Jansky. Jansky's department serves both Belgrade and the nearby town of Brooten, also in Stearns County. "I appreciate the opportunity to attend sessions like Executive Training Institute. The hard part as a small town police chief is to get training that is related to your town's size. I feel that if the committees can look into smaller departmental issues and training options, it will benefit more of us in the small community track." ETI sessions are developed so chiefs and other law enforcement leaders learn from national experts and work with each other on common Minnesota police challenges. They also have the opportunity to demo new technology at the Minnesota Law Enforcement Expo that can improve officer safety and help make the agency more efficient. Funds raised by MCPF have also been instrumental is getting new chiefs trained on the specific duties a chief law enforcement officer needs to master.